Where do Plants Come from? To answer that question, we have to go back in time. How far back? Researchers found that land plants arrived some 700 million or so years ago. Or if you want to get technical, land fungi, also a type of plant, have been around about 1,300 million years. Plants came along, and with them the ﬁrst puﬀ of breathable oxygen that some think gave rise to practically every critter thereafter. Itʼs the theory of evolution you probably learned in most schools quite early on. Plants through the process of photosynthesis take in carbon dioxide and breathe out oxygen. As an organism, how much more inﬂuential on a planet can you be? Modern man has only been around for about 200,000 years, not quite nipping at the heels of the plants on the seniority chart of living things. 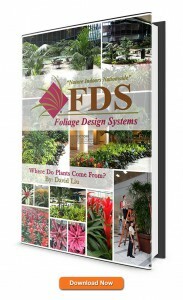 Check out our Ebook for information on our foliage interior design.